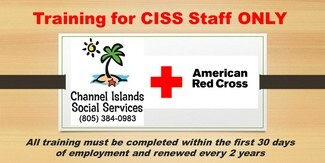 Adult/Child CPR and First Aid is required for all CISS employees every two years. Foster/Kinship Respite Caregivers are also required to be certified in Infant CPR (this course is only offered to Foster/Kinship Respite Caregivers). You must be a current CISS employee to attend one of our free classes and must RSVP ahead of time. Classes fill up weeks in advance so please plan ahead so your certification does not expire. Please note: If your training is not renewed within 30 days of expiration, your employment will be inactivated and you will be notified that you are not authorized to work. NEW! Blended Learning-Adult & Pediatric First Aid/CPR/AED: Classes are now available for renewal certification only and include an At-Home Online Session (approx 3 hours) followed by an In-Person Skills Session at the CISS office (approx 2 hours). Further instructions will be sent to you upon registering for one of the Blended Learning classes. If you run into any problems signing up, please call (805) 384-0983 ext 863.